Red Wings Unveil New Uniforms! Giant tip of the hat to a reader for emailing in this information. There was no big fanfare or public unveiling event, but the Detroit Red Wings have officially unveiled their new Rbk EDGE uniforms. Check them out. 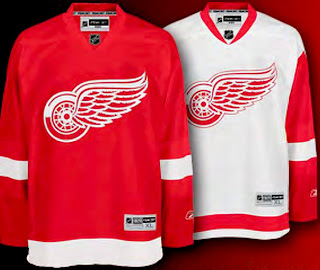 The Red Wings join the Flyers and Rangers as teams making the new jerseys available for pre-order on the web site. The graphic to the left can be found on the Wings' web site and it links to the order form. Detroit has separated itself from the Flyers and Rangers, however, by making images of the new jersey available. Anyway, the Red Wings become the eighth team to unveil their Rbk EDGE jerseys and we eagerly await the rest of the league.